Samsung had started sending out approval emails to customers who took advantage of the manufacturer’s promotion offering a free Gear VR with the purchase of a Samsung Galaxy S7 or S7 edge. From the feedback, there are indeed many people getting a free VR when purchased the S7 or S7 Edge. For those who get their first Gear VR, they may don’t know how to watch 3D movies on Gear VR via Galaxy S7/S7 Edge. So here, we gathered around all the tips and tricks about viewing 3D movies with Gear VR via Galaxy S7/S7 Edge. We hope it will be helpful. .mp4 .m4v .3gp .3g2 .ts .webm .mkv .wmv .asf .avi .flv. In our opinion, .mkv is best, while audio is aac. Only audio which Android standardly supports work and that is AAC and MP3. AC3 and DTS were removed because of high licensing costs. Make sure your movies are in 720p. John Carmack said the best format for movies is 720p, and when John Carmack says something, you better listen. If you find your movie to be not in the right format, you can download video converter program to convert your moviefile for Gear VR playback via S7/S7 Edge. I have personally used Pavtube Video Converter Ultimate, and am still amazed at how well it performs for a freemium program. In Addition: Apart from Galaxy S7, Samsung Gear VR also works on the following Samsung Galaxy smartphones: Galaxy Note 5, Galaxy S6/S6 Edge/S6 Edge+. When you make sure your 3D video is supported by Gear VR, you can transfer the 3D videos to Galaxy S7 or Galaxy S7 Edge to view on Gear VR. There are some steps below to teach you how to enjoy 3D movies on Gear VR via S7/S7 Edge successfully. On a PC, your S7/S7 Edge’s storage can be accessed from Windows Explorer by simply plugging in the USB data/charging cable – no software is required. On a Mac, files can be transferred to your phone using Android File Transfer (https://www.android.com/filetransfer/), which is a free utility provided by Google. When downloading 3D movies, you’ll notice that they come in either Side-by-Side (SBS) format, which comes in Full SBS and Half SBS, or Over/Under (or Top/Bottom) format. For the non-techie people, they refer to the resolution of the movies and the way the two frames are separated (vertically for the former and horizontally for the latter). A Side-by-Side format comes in 1920 x 1080. Full SBS nets you the full resolution in both frames, while Half SBS gives you 960 x 1080 for each frame. On the other hand, the Over/Under format comes in 1280 x 720, with each frame coming in at 1280 x 360. Yes, the quotes are included. So, Over/Under movies in your 3D movies folder should have two accompanying files: the .png file for the poster image (assuming you got one) and the aforementioned text file. Except for that last part which borders on the technical side, watching movies on your Gear VR is a simple matter. All you really need to do is copy your movies in the correct folder and you’re good to go. Just like we said above, the perfect compatible 3D for Gear VR is SBS MKV and MP4. So if you have some 3D movies download from YIFY, YouTube, forfree3d.com, 3dmoviesstreaming.com or you have some 3D Blu-ray, DVD and want to view these videos on Gear VR via Galaxy S7/S7 Edge, you can use a video transcoder to re-encode videos to 3D SBS for Gear VR. Run this 3D Video Converter for Gear VR (Mac version)on your computer. For disc-based concent,insert your 3D/2D Blu-ray/DVD movie to disc drive, and click “Load from disc” button to load Blu-ray or DVD from ROM. For video file, click the “Add video” button, browse to computer hard drive and import video into this app.Batch conversion feature allows you to import multiple source videos to converted to Gear VR. Tap on “Format” bar and find “3D Video”, there are a lot of format options for you. “MP4 Side-by-Side 3D Video (*.mp4)” is recommended for Samsung Gear VR.Or you can choose 3D SBS MKV for Gear VR playing with Galaxy S7/S7 Edge. You can click “Settings” near the “Format” to adjust the video resolution and bitrate to get more compatible format with Gear VR. 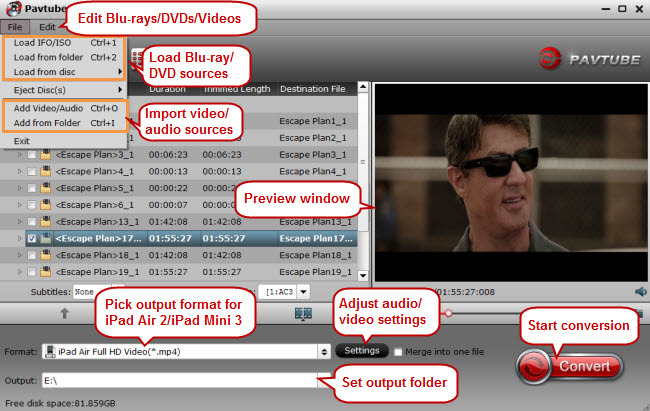 Click “Convert” button, video to SBS 3D MP4 or 3D SBS MKV conversion begins. When the process finishes, open the output folder to locate the 3D SBS video for Gear VR. 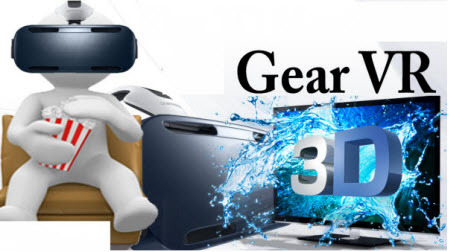 Now, setup your Gear VR and put these converted SBS 3D MKV/MP4 video files in the ‘MyVideos’ folder miscroSD of VR Gear and start your theatric 3D experience at home!